Lake Draper is easy to get to! For Directions from any address to the Marina, click here. 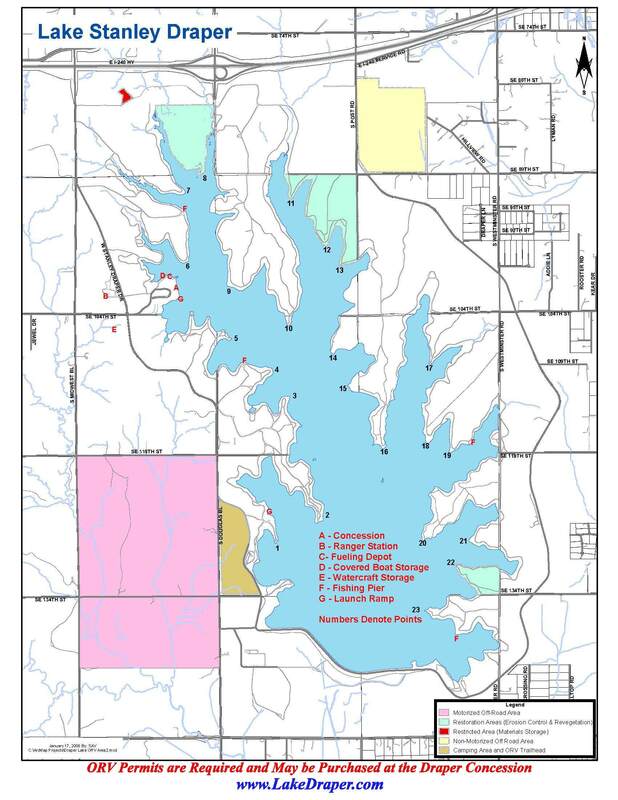 Lake Stanley-Draper Marina is located on the south-east side of Oklahoma City just minutes from I-35 and I-240. The Marina is conveniently accessible from I-240, I-35, I-40, and Sooner Road. For a map of the entire Lake Draper area including the marina, click here. Turn East on SE 104th St (2 miles South of I-240). Drive East 2.25 miles until you reach a STOP Sign at the Intersection of 104th and West Stanley-Draper Drive. Continue East through the intersection and follow the curve. Split right at the fork and follow the road around to the Marina. Take Exit 8 and drive South on Sooner Road. Continue South on Sooner to SE 104th St. Follow the directions listed above. Take Exit 165 where I-40 and I-240 split. Cross back under I-40 continue West on I-240. Follow the directions listed for I-240. Take Exit 121B and drive East on I-240. Check out the 2005-06 OKC Parks Guide for additional information.